Lt. 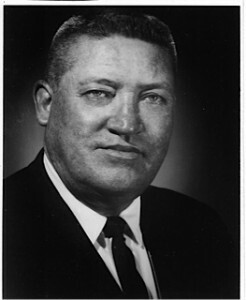 Colonel James L. Farmer, United States Army, retired, was born on 30 October 1912 in White Plains, Hopkins County, Kentucky. He was the son of Walter Farmer and the former Martha Gunn. 1940. He was stationed at Fort Knox, Kentucky on the first of April 1840. Jim’s rank was Sergeant at that time and he was assigned to the Headquarters Troop of the 1st Cavalry Regiment. During this month he married the former Geraldine Morse who was working at Fort Knox. 1941. His daughter, Marian Theresa Farmer, was born in Fort Knox on 5 April 1941. 1946. His son, Thomas Walter Farmer, was born in Philadelphia, Pennsylvania around October 1946. 1949/52. Jim was stationed in Japan at this time. 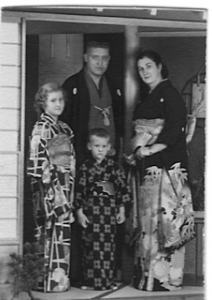 His wife and two children sailed from Seattle to Yokohama on 17 March 1950 on the USNS Shanks. Their home address was listed as 6143 Ogontz Avenue, Philadelphia, Pennsylvania. 1952. 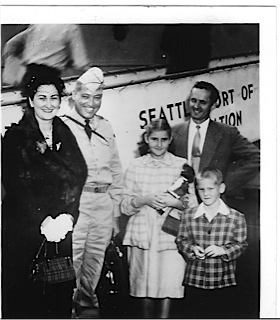 His wife and two children sailed from Yokohama to Seattle on 27 August on the USNS General Hugh J. Gaffey (TAP 121). Their destination was listed as Amphibious Training Command, Coronado, California. Jim Farmer circa 1960 working for Motorola. Colonel Farmer died on 11 August 1982 in the Good Samaritan Medical Center, Phoenix, Arizona. James was survived by his wife, Geraldine M., who was born during 1915 in Philadelphia, Pennsylvania; his daughter, Marian Theresa Miller; his son, Captain Thomas W. Miller; plus 4 sisters and a grandson. His wife, Geraldine, passed away on 31 January 1994 in Mesa, Arizona, survived by her two children and 4 grandchildren. Her services were conducted at the Valley Presbyterian Church, 6947 E. McDonald Dr., Paradise Valley. Arrangements for Geraldine were by Green Acres Mortuary, 401 N. Hayden Road, Scottsdale, Arizona.